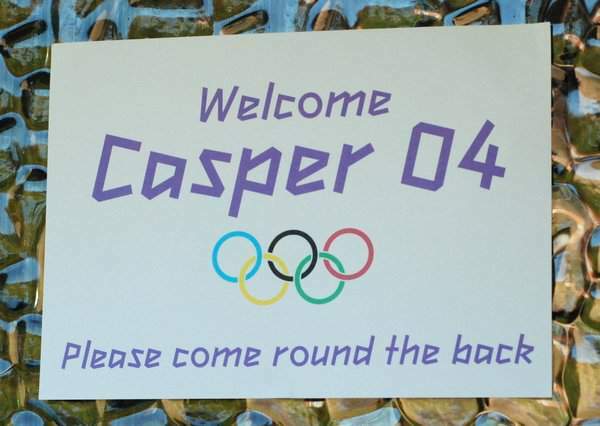 Over a month ago we had an Olympic themed party for Casper’s 4th birthday. 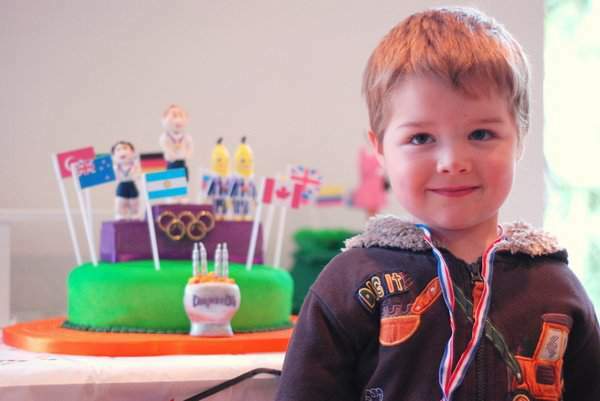 I’ve already showed you the ‘Olympic Playdough Kits’ that I did for the party bags and I’m back to talk about the rest of the party. 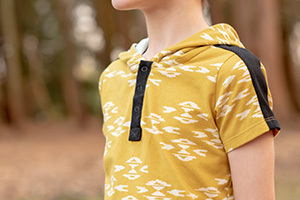 I should probably warn you now that this is a pretty long post as I’ve got a lot to show you. We’ve had themed parties in the past but this was the first year that I attempted a full dessert table with co-ordinating printables and decorations. It definitely took a lot more effort but I loved the results and so did Casper. 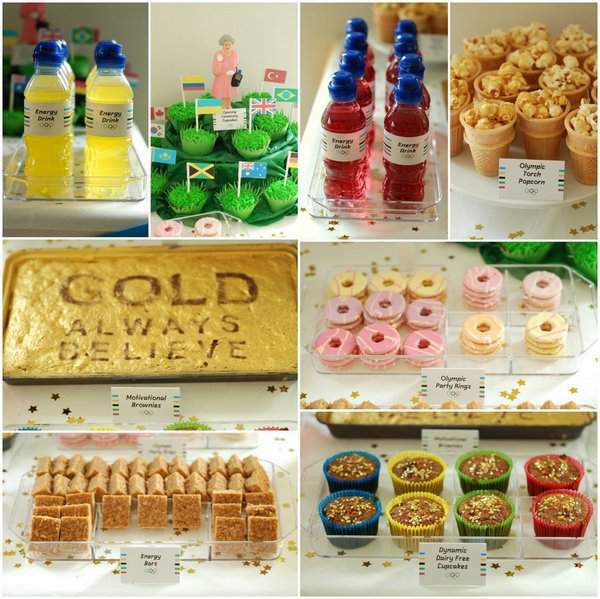 Since the party took place a few months after the actual London Olympics I was able to use some of the details from London 2012 and also pick up some ideas from Olympic parties featured on other blogs. The first thing I made was the invites. 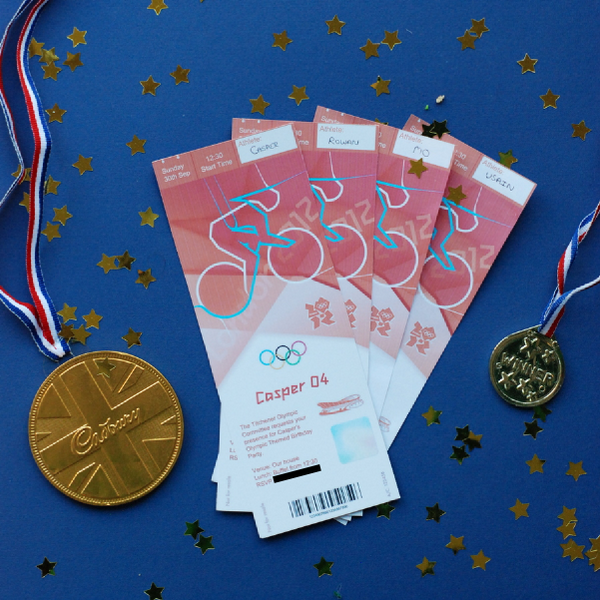 I got the idea for this from Bird’s Party Blog but adapted one of the actual London 2012 ticket designs, changing it to Casper 04. These were created in Inkscape, as were all of the other printables used to label food and drinks. 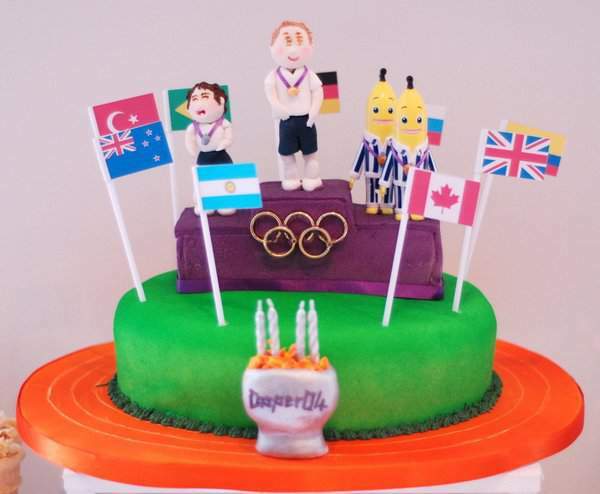 My mum made the main birthday cake, which was an Olympic Podium with edible models of Casper and Rowan in gold and silver. The other fellas sharing bronze are plastic models of B1 and B2, who are from ‘Bananas in Pyjamas’, Casper’s favourite TV programme. Isn’t it amazing? Casper absolutely loved it and he still hasn’t eaten the models. 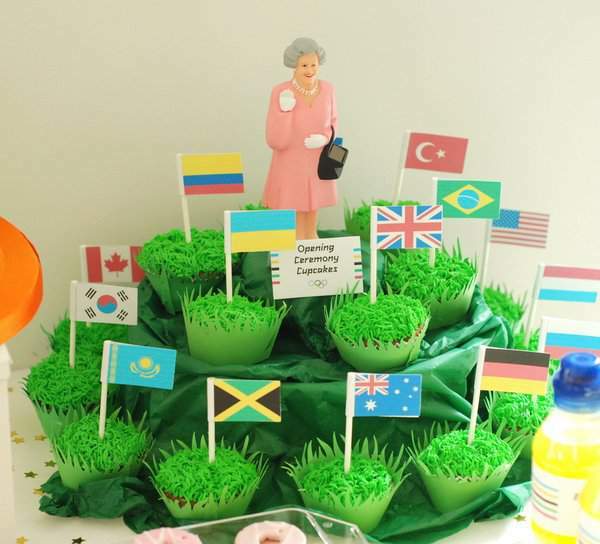 The most time consuming things to make were the ‘Opening Ceremony Cupcakes’. These represent the hill at the incredible London 2012 opening ceremony, where the flags were placed towards the end. My friend Orla was generous enough to lend me her waving queen and you may have spotted earlier that there’s a helicopter above the queen, making a feature of our poorly located thermostat. Sadly I couldn’t find a James Bond to accompany her Majesty. I made all the flags well in advance, which took quite a while playing around with Inkscape. Once I’d printed and cut them out I attached them to lollipop sticks. To display the cupcakes I layered two cake stands and covered them and some of the table with green crepe paper to give the shape of a hill. I used this recipe (without raspberries) for the cupcakes and decorated them with green butter icing using my grass piping nozzle. Finally I added a grass cupcake wrapper – I’ve done something pretty similar before for my quackaroons on pond cupcakes. 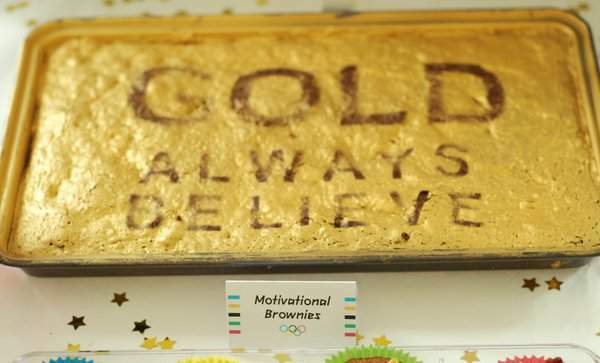 I used the recipe I wrote about here for the ‘Motivational Brownies’ and decorated it by fixing down some letters (cut on my digital cutter) and spraying with edible gold shimmer spray. I wasn’t quite sure how good it would look after I’d cut it up so displayed it uncut. The party rings and energy bars (or flapjack) were just shop-bought, as were the popcorn and the ice cream cones I used for the ‘Olympic Torch Popcorn’. I got the idea for that from this brilliant Olympic party. We didn’t just serve dessert – we also had a BBQ and a few other savoury options but not many of those fit in with the theme, except for these ‘Cheesy Athlete’s Feet’ sandwiches. 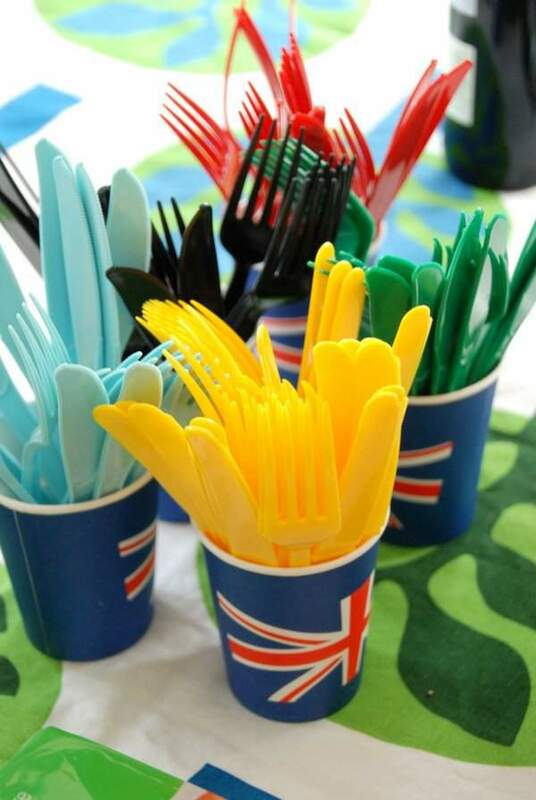 Of course we had colour co-ordinated cutlery as well. 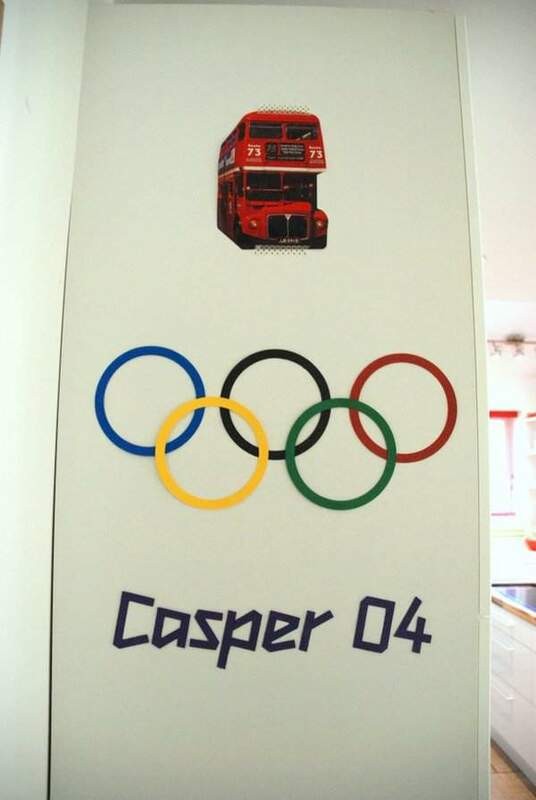 I bought this when I did the Olympic Party Spoons, during the Olympics. 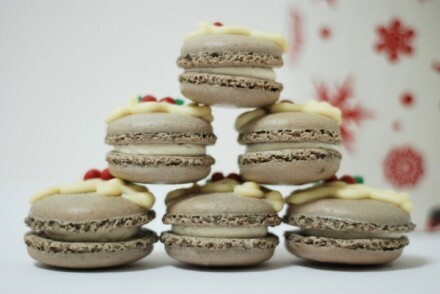 Unfortunately I didn’t find time to make them again for the party. As most of the children coming to the party were quite young we didn’t have too many organised games. The main activity was a ‘Pass the Olympic Torch (Parcel)’. As we had 16 children this took quite a while. 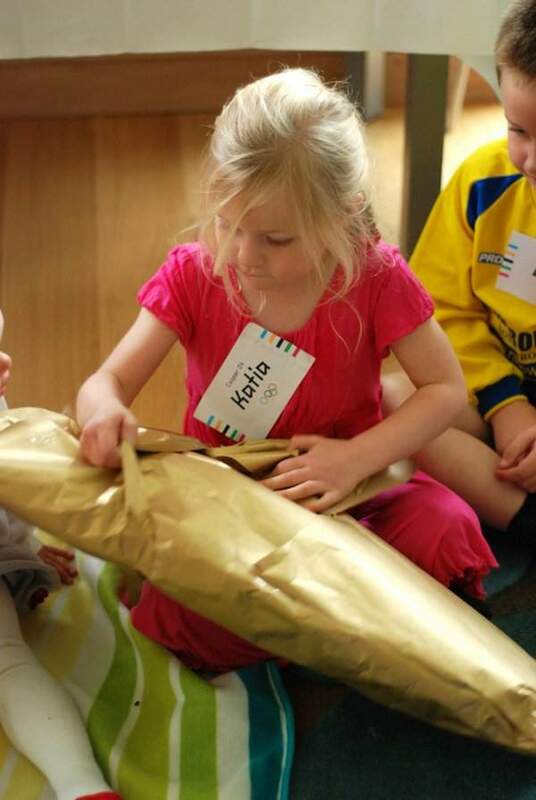 Here is my cousin’s daughter Katia unwrapping the first prize. You can also see the name labels that I made for all the children. One advantage of having the party so far after the actual Olympics is that I was able to pick up a lot of the official merchandise quite cheaply. The older children received a London 2012 multi-coloured pen and the younger ones got a mini soft toy of the official mascots, Wenlock and Mandeville. I also handed out a gold medal to each of the children during the party. Brilliant isn’t it? 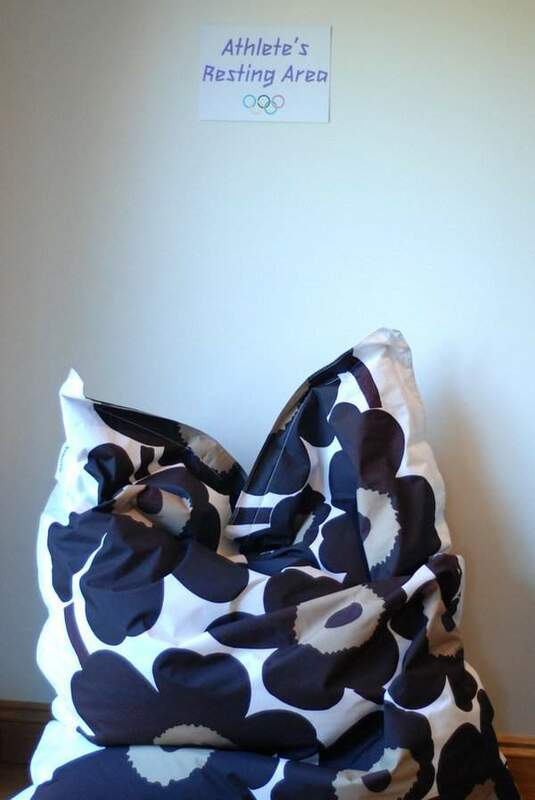 Needless to say this was put together rather last minute but proved to be very popular. I had lots more ideas for organised activites, such as running races, long jump, hurdles and syncronised trampolining that I’m sure would be lots of fun for an older child’s party. 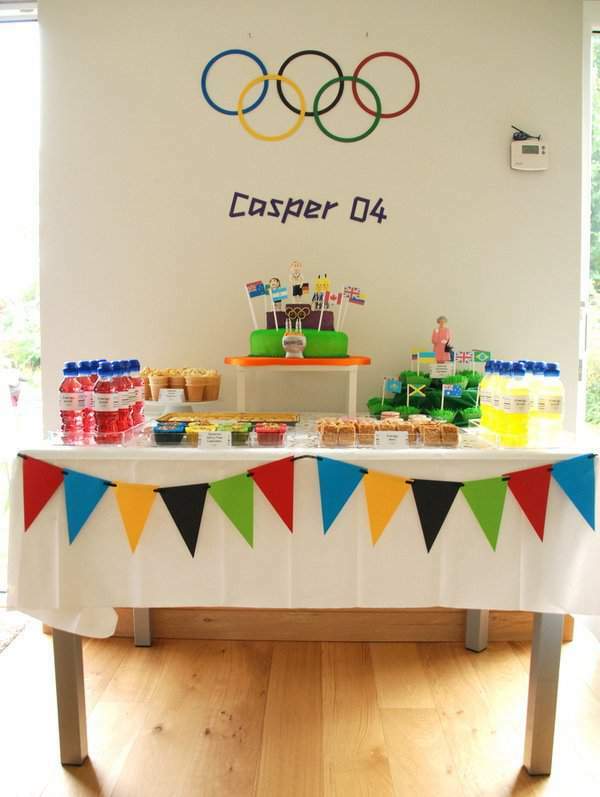 I used the Olympic Ring colours as the main colours for all the decorations. 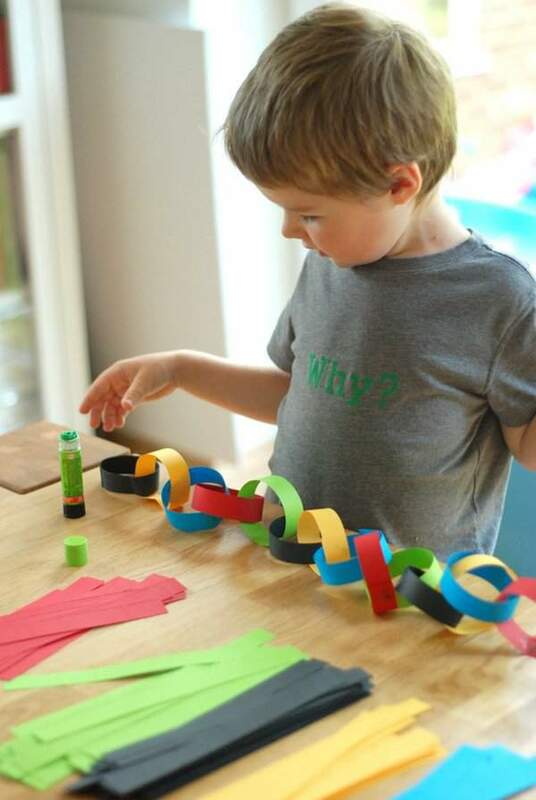 To involve Casper I cut several strips from A4 paper and he set to work making a paper chain. I also made some bunting out of the same paper, strung on black ribbon, to go around the dessert table. 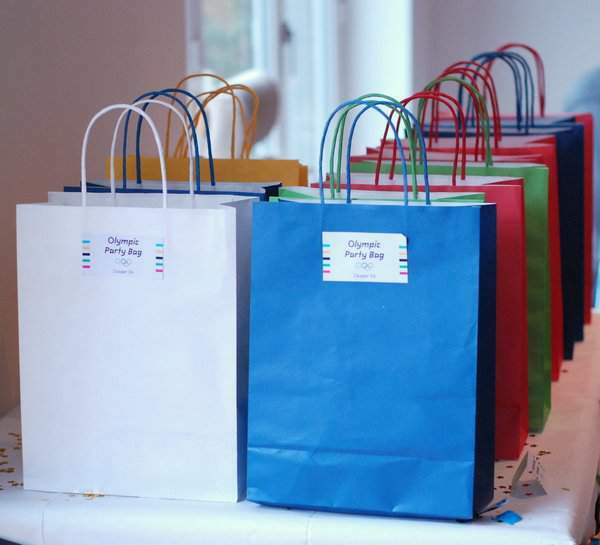 We made lots of printables for the food, drink and party bag labels. Some were printed out on paper and others on sticker paper. 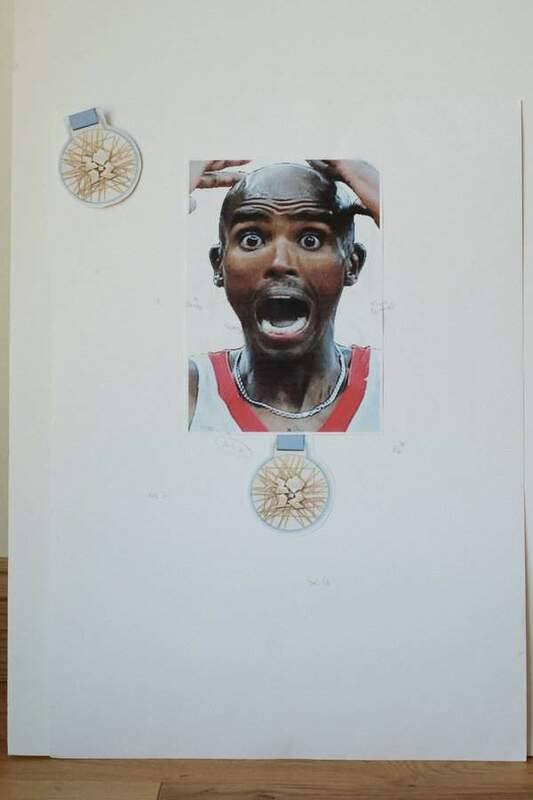 I also made some Olympic Ring tattoos as real versions of this are very popular amongst the athletes. Unfortunately I forgot to hand these out at the party. My digital cutter got quite a work out in the run up to the party, as you’ve probably already noticed. I used it to cut the rings and the ‘Casper 04’ sign that I used on the wall behind the dessert table and also on another wall in our house. We had a few other signs up. I did print out some numbers and set up a podium but I don’t have any pictures of that. This is one problem I found with hosting the party – I just wasn’t able to take as many photos as I would have liked and those I did manage were a bit rushed. I think next time that is something I’d try to plan a bit better or, failing that, get Casper to make friends with a photographer’s child. 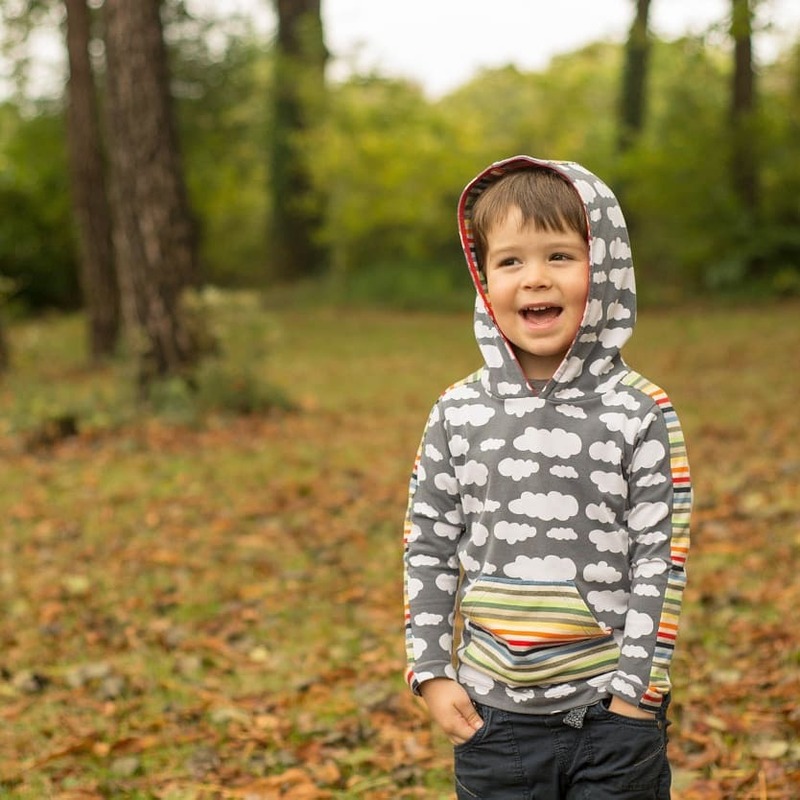 I would love more photos of the children, especially Casper. Ultimately though he was thrilled with the party and that’s what is most important. Wow! All the effort you went to really shows! Everything looks fantastic! 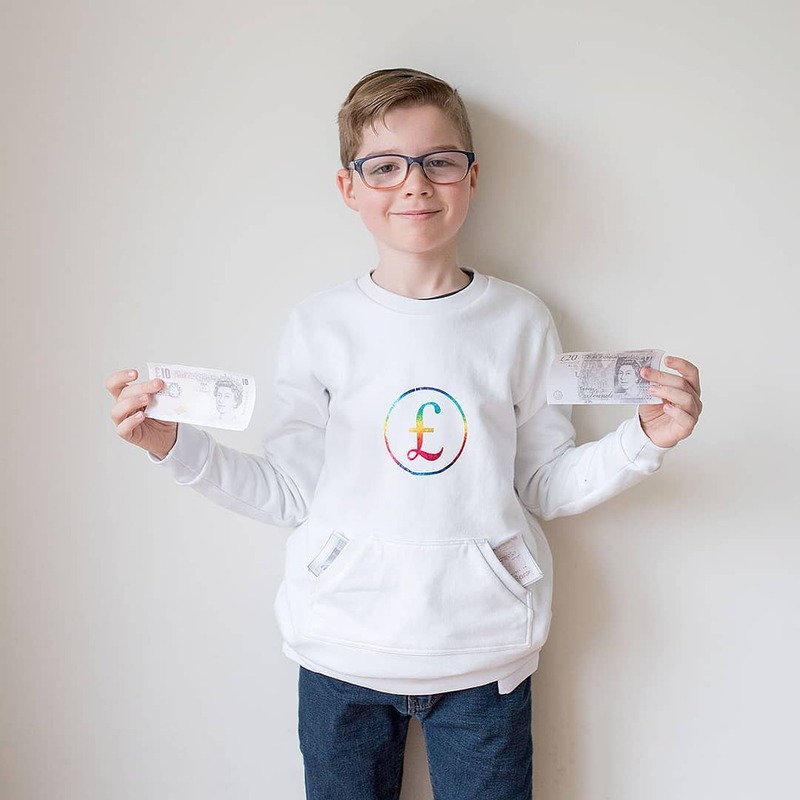 I love the tickets and your Mum’s cake looks amazing! We’re not very good at remembering to take photos either. I am glad Casper hasn’t eaten the models it would be cannibalistic! Also they have spaghetti scaffolding inside!! It was a fabulous day. 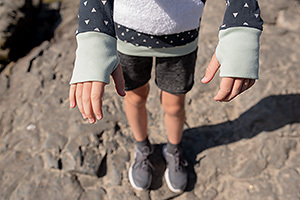 You could task Dad with taking photos next time. You are so incredibly talented…this looks AMAZING!! And you clearly get some of that talent from your mum as her cake looks wonderful too. 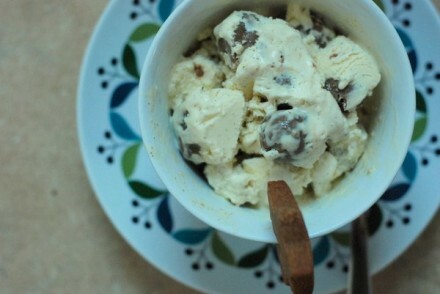 Love the idea of a dessert table – one day I’m determined to do one. oh man, this is so cute and fun!!! 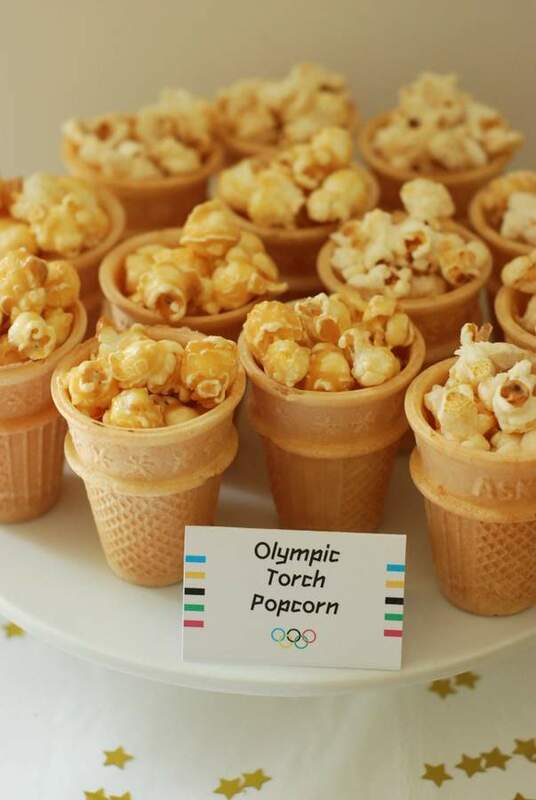 i think the olympic torch cones are my favorite. 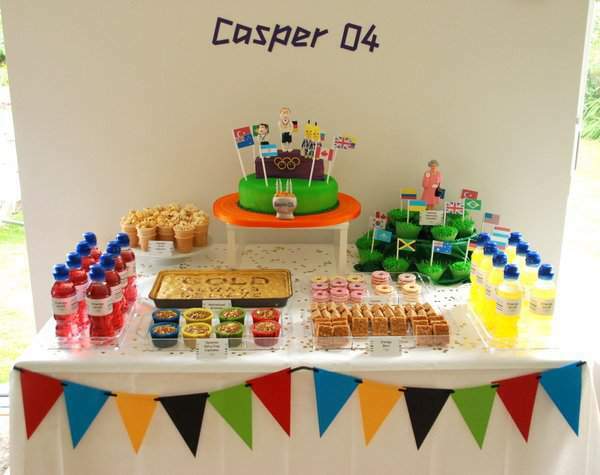 happy birthday, casper! 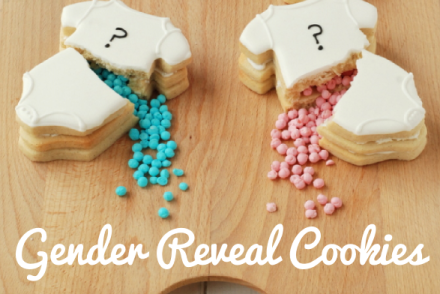 So many fab ideas here – so impressed! THIS IS A GREAT PARTY IDEA BUT I AM NOT SURE THIS WOULD WORK WITH AN OLDER KIDS PARTY. I AM HAVING THE SAME PARTY TOMMORROW AND I WILL DEFINETLY BE USING SOME OF THESE IDEAS.